Kirsten Grosenheider - Burns Anderson Jury & Brenner, L.L.P. Born an Eastern Airlines baby and Floridian, Kirsten and her family moved to the Austin area in 1989. She attended the University of Texas at Austin, where she was a member of Psi Chi, the international honor society in psychology, and attained University Honors. 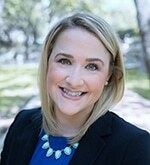 Kirsten began working with BAJB during the summer of 2008, worked throughout 2009, and rejoined the BAJB team after graduating from South Texas College of Law in 2010. During her time at South Texas, Kirsten served as a research assistant for Professor Maxine Goodman, and was on the Dean’s List. She joined the firm as an associate after receiving her license from the State of Texas in 2010. Kirsten primarily focuses on workers’ compensation and the representation of carriers at the administrative level. She additionally assists workers’ compensation insurance carriers in responding to Conditional Payment Notices and Demands received by the carriers from the Centers for Medicare and Medicaid Services (CMS). Her “downtime” consists of spending time with her identical twin girls and husband, Aaron.